Sky+ is a standard definition satellite receiver and Personal Video Recorder (PVR) in one. Sky+ Gives you the freedom to easily plan and record programmes for days ahead, in a matter of minutes, freeze live programmes and rewind to watch the start of a programme that you might have missed. Record one satellite channel while watching another. Record without a video – No timers, no tapes. Sky+ records an average of 20 hours on its internal hard drive. Pause live TV – Just pause whatever you’re watching, you can even fast forward to catch up with live TV. Instant rewind – Sky+ allows you to rewind the programme you are watching – so if you come in halfway through a programme, you will be able to rewind and watch it from the start without missing the beginning. Home Cinema – With a Sky+ Digibox you can connect to a compatible home cinema system and watch selected widescreen movies in Dolby Digital 5.1 surround for the real Home Cinema experience. 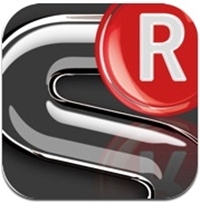 NOTE: Sky no longer offer Sky+ receivers, Sky HD is now the standard Sky receiver. Sky+ has its own electronic programme guide made by Sky. From here, users can see what programmes are on in the next seven days. The current EPG software version (as of July 2010) is Sky+ 5.08.6. Can Sky+ be used outside the U.K.? Yes, though your Sky+ box should be connected to a phone line (UK Landline), this is in the Sky contract. However, Sky do not seem too bothered about this, and there are many viewers using Sky+ on the Continent. A Sky+ receiver/PVR has 2 tuners (so that you can record one channel while watching another), this is connected to a universal LNB with at least 2 outputs. 1. Sky+ 40 GB (Discontinued) – Version 1. An average of twenty hours of recording time. The first generation of boxes (referred to as a PVR1s within Sky) was manufactured exclusively by Pace for the UK Market. The second generation of 40 GB boxes (referred to as PVR2s), were manufactured by both Amstrad and Pace. 2. Sky+ 160 GB (Discontinued) – Version 2. Sky+ 160 has an average of eighty hours of recording time. Sky+ 160 was manufactured by Thomson only for the UK market. 3. Sky+ 80 GB (Discontinued) – Version 3. Manufactured by Altech UEC, Pace, Amstrad and Thomson. Launched in September 2005 as standard Sky+ box, the box has an average of forty hours recording time. The drive has a 160 GB hard drive installed, however half of this (80 GB) is “reserved for use by the Sky Anytime TV service”. This version is known as a PVR3 or Sky + 80/80. Although the different generations of Sky+ look similar, they have minor external differences (viewing card positions etc.) and significant internal differences. By December 2005, Sky+ 80 GB boxes manufactured by Pace, Amstrad and Thomson were being installed. Many people have reported various problems with different boxes. A persistent complaint is that early Amstrad 80 GB models are noisy in operation. The Amstrad models also reportedly display a more jerky image when in 30x fast forward and rewind. Pace and Thomson variants are preferred. However, other posters maintain that the reliability of all makes is statistically similar and that there are good and bad boxes from all three manufacturers. 1. AC Input – From mains power supply. 2. Telephone line Connector RJ11. 3. UHF Modulator – For connection to the main TV and optional connection to the second TV. 4. TV A/V SCART – Provides either composite or RGB and composite video output. Audio volume can also be controlled in software. 5. VCR A/V SCART – VCR Scart for connection to Video Recorder. 6. Analogue Audio Outputs – An important addition for users wishing to integrate the set-top box into their home audio system. Volume can be adjusted or muted under software control. 7. S-Video Connector – For high-quality connection to plasma monitors or Recorders. 8. SP-DIF – For connection to home Dolby Digital amplifier. 9. RS232 – Serial port connector for service and factory use only. 10. RF Input – Twin IF inputs to connect to dual LNB at the dish. Sky+ has its own electronic programme guide (EPG) made by Sky. From here, users can see what programmes are on in the next seven days. The current EPG software version (as of April 2006) is Sky+ 4.10.c. To check which version of software your Sky+ box is using, press the Services button, System Setup menu, option 5, ‘System Details’. You can force your Sky box to update to the latest software, this is done in the same way as standard Sky Digital receivers. You can see which programmes have been recorded, which have been viewed, by pressing the blue button on your remote the selected programme will be kept and can not be deleted. In 2008 Sky introduced a revamped Electronic Programme Guide (EPG) , for all Sky HD boxes and newer Sky+ boxes. Connect your Sky+ receiver to a landline, this will allow it to be used with Interactive services, including your account details. Sky+ remote controls are similar to a typical Sky Digital remote, but provides controls for the extra features, e.g. rewinding the programme, record, play or pause, fast forward and stopping playback of the programme. The Sky+ remote is silver coloured or beige for the early remotes issues with 40GB Boxes (like the set-top box) rather than the dark blue of the normal Sky remote. The Sky+ remote uses entirely different codes to a standard Sky Digital remote control and so is, by default, incompatible with it. This is probably intentional, as some homes will have two subscriptions and would not want the risk of the controls operating the wrong equipment. However, the Sky+ handset can unofficially be programmed to control a digibox and indeed even Home A/V Centres and amplifiers. 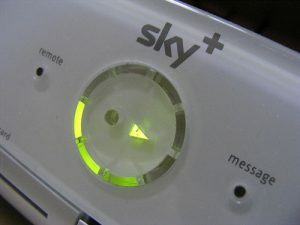 As of July 2007, all Sky+ remotes (Version 8 onward) have blue buttons, rather than the standard green. There is also a Sky+ Remote Control Easy Grip control, which allows you to control your Sky box and your television. It’s specifically designed to assist older customers and those with reduced dexterity. The Sky+ for Android and iPhone application lets subscribers with a connected (UK Landline) Sky+ box dial in recordings from their phone. Remember, your Sky+ receiver has to be connected to a landline for this to work. You can connect a DVD or video recorder to your Sky+ box, to allow you to copy shows recorded on your Sky+ box… great for archiving series recorded using series link. Note that there is a restriction on copying Sky Box Office movies. Connection to a recorder can be made via the box’s two SCART sockets, or via the modulated output. 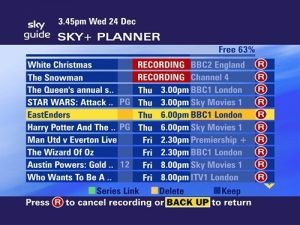 The Sky+ receiver supports ‘padding’ or recording offset, which is a setting that allows you to add a number of minutes of recording time to the scheduled start and end times of programmes. This means that the receiver will record a few extra minutes in case a programme does not start quite when it should, for occasions where the Sky+ EPG isn’t aware of overruns. To edit the settings, press Services, and select Sky+ setup. Connect Sky+ to a compatible home cinema system and watch selected widescreen movies in Dolby Digital 5.1 surround sound. Sky Premier Widescreen and Sky Box Office Widescreen aired a wide selection of movies in Dolby Digital 5.1 sound. To get Dolby Digital 5.1 with Sky+, you need to connect an optical digital audio cable between your Sky+ set-top box and your Dolby Digital 5.1 compatible home cinema amplifier/processor. You will then be able (with the necessary six speakers) to get surround sound through five audio channels (left, centre, right, left surround and right surround), plus a sixth channel giving low frequency (bass) effects. Check Sky listings to see which films are available in Dolby Digital 5.1. Copy+ is a powerful piece of FREEWARE software designed exclusively to copy the hard drives from Sky+/XTV set-top boxes. There is literally nothing else available that can do what Copy+ can. Plusworld was formed due to the lack of consistent feedback from Sky to its customers over Sky+. The site was created because like you we wish to make Sky+ the best it can be, by voicing our concerns and acting on them.